In the era following the NFL and AFL merger, no quarterback was more successful than Terry Bradshaw, leader of the Pittsburgh Steelers. He was the first great quarterback for the franchise and Bradshaw also became the first quarterback to win three, and later four, Super Bowls in league history. 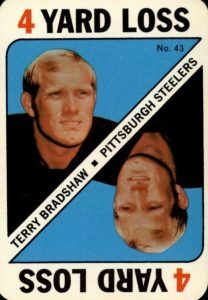 Featuring top cards from his playing days along with more recent autographs, the list below contains some of the best Terry Bradshaw football cards to collect. Bradshaw was the first overall pick in the 1970 draft and quickly established himself with his strong throwing arm. He led the Steelers offense by calling his own plays and took the team to four Super Bowls, twice being named Super Bowl MVP. After retiring in 1983, Terry enjoyed a successful career as an announcer, as well as a part-time actor. He was elected to the Pro Football Hall of Fame in 1989. 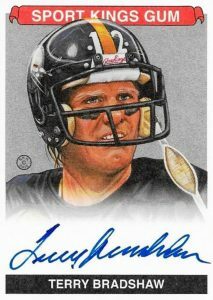 Shop for Professionally Graded Terry Bradshaw Cards on eBay. Bradshaw famously attended the little-known Louisiana Tech University and fans of his college days can turn to a few sets that showcase Terry as a Bulldog. In 2015 Panini Immaculate Collection, fans can find a relic card featuring maroon jersey pieces and the 2009 Topps Magic set featured many NFL stars in their college uniforms, including Bradshaw in his La. Tech jersey. The Magic set contains an All-American insert card of "The Blonde Bomber" along with a base card. Another early card for Terry Bradshaw that didn't quite make the list is part of the 1972 Sunoco Player Stamps. These were issued by the Sun Oil Company at their gas stations. 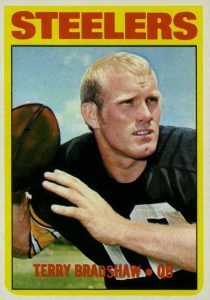 The set was huge at 624 players with Bradshaw's stamp being one of the most valuable. In 2015 Topps 60th Anniversary, Topps added a Bradshaw sticker autograph to a reprint of his 1971 Topps rookie. Collectors can pick up that signed version for a fraction of the price of a highly-graded '71 rookie. Terry's success on the field and in the Super Bowl, combined with the legacy and following of the Steelers, made him one of the most popular players of his era. As such, many of his cards command attention from collectors. Key factors in deciding each card's placement include value, design, and availability of the cards. 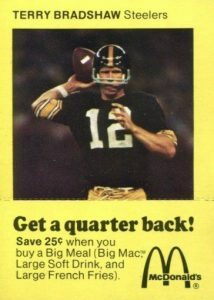 In 1975, McDonald's restaurants issued four "quarter back" football cards that offered customers a 25-cent discount on their purchase of a Big Meal. The top portion of the yellow card could be separated when the coupon was redeemed, making many examples smaller in size. One card was available each week and collectors could piece together the QB set over the course of a month. Along with Bradshaw, future Hall of Fame member Ken Stabler was also included. 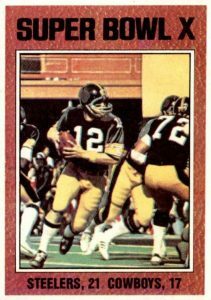 The 1976 Topps set featured cards devoted to the NFC and AFC Championship games as well as this card for Super Bowl X. Bradshaw is shown rolling out behind his offensive line as he led the Steelers to their second Super Bowl title. The reverse side of the card provides the game's box score and statistical leaders for the win over the Dallas Cowboys. It also highlights Bradshaw's excellent passing attack which included a famous 64-yard throw to Lynn Swann who bobbled the football and caught the pass nearly laying on the ground. 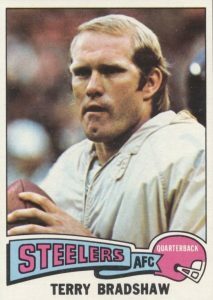 Bradshaw's 1975 Topps card finds him at the top of the NFL after leading the Steelers to Super Bowl IX where they beat the Minnesota Vikings 16-6. Bradshaw was typically at his best during his four Super Bowl appearances. Over the course of his career, he threw for 300 or more yards in just seven games but two of them came during the Super Bowl. Including Super Bowl IX, Bradshaw would lead the Steelers to eight straight playoff appearances. The 1974 Topps design is one of the most unique that Topps used for their football sets. You might not notice it initially but the player's photos were placed between the uprights with the goalpost color changing from team to team. Bradshaw continued to progress into one of the elite quarterbacks in the league, leading the Steelers to back-to-back playoff appearances in 1972 and 1973. This was especially notable given that their last playoff appearance came 25 years earlier, in 1947. Using the same main design as the iconic 1933 Sport Kings set, Bradshaw was featured on a original art card in 2015 Leaf Sportkings. Also similar to the 1933 set, the 2015 edition had a mixture of athletes from all of the major sports. 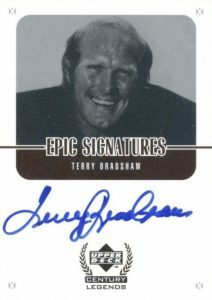 Bradshaw's autograph card was part of the Sportkings Signature insert and limited to just fifty copies. While this is a rare autograph release for Bradshaw, he has also signed for plenty of other products over the years. The 1971 Topps Game Cards were designed like a deck of playing cards with 52 players plus an extra card that serves as a first-down marker. The cards had positive or negative plays with Bradshaw's card counting as a four-yard loss. A single game card could be pulled from each pack of 1971 Topps as an insert. Because the card was issued during Bradshaw's rookie year, it has become one of the most valuable cards in the set. 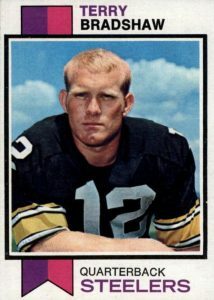 Terry gives the camera a stern look on his 1973 Topps card that might be more reminiscent of the Steelers' famous "Steel Curtain" defense, renowned for their tough play. 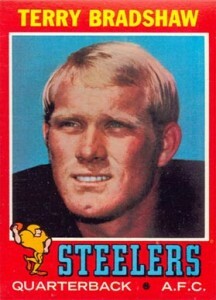 The back of Bradshaw's card highlights his being the top overall selection in the 1970 NFL Draft. His fate was determined by a coin flip between the Chicago Bears and the Steelers, as both teams finished 1-13 during the 1969 season. The Steelers won the coin flip and the rest is history. One of Bradshaw's earliest on-card autographs can be found in 1999 Upper Deck Century Legends. The set has a very impressive checklist with the first autographed cards for several Hall of Fame members. The cards themselves offer a simplistic design that focused on open space and allowed the player to sign near the center of the card. The Epic Signatures insert also features a black-and-white photograph with Bradshaw's image coming from the end of his historic career. This 1972 Topps card features a fresh-faced Bradshaw ready to throw a pass. During his 1970 rookie season, he shared quarterback duties with another Steelers' quarterback—Terry Hanratty—but Bradshaw took over the full-time job during the 1971 season. The card back makes note of his success while in college at Louisiana Tech University, where Bradshaw became the school's leader in almost every passing category. 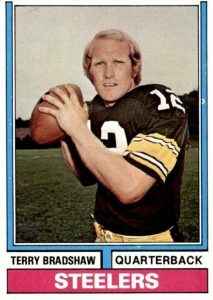 A clear favorite for collectors, the Terry Bradshaw rookie card was released in 1971 Topps. The players from the NFC had cards with blue borders and AFC players, including Bradshaw, were given red borders. Bradshaw's card has become the top rookie card and the most valuable card in the entire set. Near mint/mint versions of the card regularly top $2,000 at auction and mint cards can reach prices that are ten times as much. 2018 NT Steelers Terry Bradshaw Parallel base card #'d 12!!! 2007 TOPPS CO-SIGNERS TERRY BRADSHAW FRANCO HARRIS 1 1 BGS 9.5 9 AUTO ! !